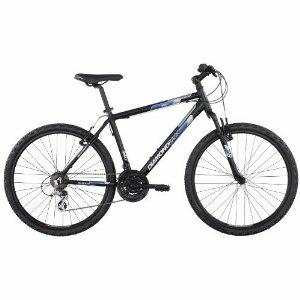 The Diamondback 2012 Sorrento Mountain Bike is one of the latest mountain bikes from Diamondback Mountain Bikes. It is a rugged bike, that will do a great job of getting you around, whether it is on rugged mountain paths, challenging courses, gravel trails, or even simply just on your neighborhood streets. The Diamondback 2012 Sorrento Mountain Bike is a very versatile bike that is just as good for getting you to class as it is at handling rugged trails. This is thanks to its 60mm travel suspension fork that makes going over bumps easy and painless. It also has 21 speeds that will allow you to climb even the steepest hills. No matter where or how you prefer to ride, the Diamondback 2012 Sorrento Mountain Bike will take you wherever you want to go. One of the nice things about the Diamondback 2012 Sorrento Mountain Bike is that it comes pre-assembled. There are just a few parts that you have to install, like the steering bar, front tire, and pedals. It is very easy to put together the few pieces that are not already there so even if it is your first mountain bike, you shouldn’t have any problems assembling it. Once you have it together you will be looking at one sweet ride. You can tell that the parts of the bike are very well made, especially the durable, butted T6 aluminum frame that is also very light. You won’t have to do much tweaking to the bike out of the box, since you will notice that it runs smoothly and fast, with smooth shifting gears – right out of the box. This is one of the few bikes that you won’t need to take in to the bicycle shop to make sure everything is ride ready before you take it out. As far as the downsides go, there are a few. The seat could be more comfortable, as it feels a bit hard. The hand grips could also use an upgrade since they will hurt your hands after a long ride. The brakes may need some adjusting as well, depending on your preference. There have been reports of incorrect instructions shipping with some Diamondback 2012 Sorrento Mountain Bikes, listing incorrect wrench sizes, as well as incorrect instructions for adjusting the handlebars. There have also been reports of the quick release for the front tire being found loose in the box, but these seem to have been isolated incidents. Once again, Diamondback Mountain Bikes have done a great job with the Diamondback 2012 Sorrento Mountain Bike by packing a lot of features as well as a high quality build into a package that won’t break the bank. While it might not be the cheapest (it’s currently $300 on Amazon), the Diamondback 2012 Sorrento Mountain Bike gives you a lot of bang for your buck. This entry was posted in Bikes, BMX, Diamondback, Reviews and tagged Diamondback, Mountain Bike. Bookmark the permalink.